William Christie, musical director, harpsichordist, and founder of the Baroque music ensemble Les Arts Florissants, has gained renown worldwide for his concert performances. To further training in the seventeenth- and eighteenth-century repertoire, he created an academy for young singers (Le Jardin des Voix) in Caen, France, in 2002. In 2007 he extended his teaching career to include American students, accepting the position of artist-in-residence at the Julliard School in New York City. A resident of France since 1971, Bill has restored an ancient manor house and created a stunning and highly original garden on his property in the department of the Vendée in the Pays-de-la-Loire region of west-central France. 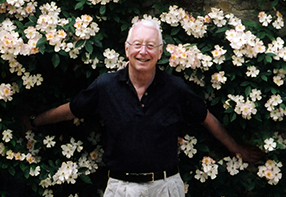 To bring his passion for early music, teaching, and gardening into perfect harmony, in 2012 he launched an annual festival, Dans les Jardins de William Christie. During the festival, laureates of Le Jardin des Voix and Julliard perform throughout the garden. Bill was named a Chevalier de la Légion d’honneur in 1993 and elected a member of the French Académie des Beaux-Arts in 2008.
in the department of the Vendée in the Pays-de-la-Loire region of west-central France. To bring his passion for early music, teaching, and gardening into perfect harmony, in 2012 he launched an annual festival, Dans les Jardins de William Christie. During the festival, laureates of Le Jardin des Voix and Julliard perform throughout the garden.